Unfinished, standard size grilles in Afrormosia, Albizzia, Brazilian Rosewood, Bubinga, Burmese Teak, Celtis, Caboreiba, Danta, Doussie, Iroko, Izombe, Mutenye, Okan, Ovangkol, Padouk, Panga Panga, Sapele, Tali, Wenge, and Zebrawood are available from Brenco Exotic Woods. 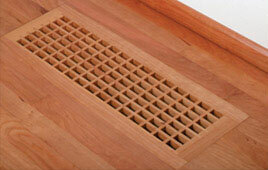 Supply and Return air grilles are available in Flush w/ Frame, Self Rim, Flush Mount, and Flush Rim styles. Please refer to individual styles for standard size and style options. Custom sizes and thicknesses are available upon request. 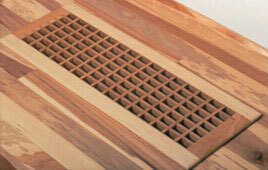 Vents are pre-sanded and ready for on-site finishing; no additional preparation is required. These return air vents are available in 1" x 1.5" on center rectangles, 1" x 1" on center squares, and 1.5" x 1.5" on center squares. Custom thicknesses and sizes available upon request.